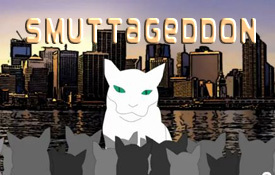 Smutty’s human has been busy working on his debut video, Smuttageddon. nemesis who continues to get in the way. Please let us know in the comments if you like the trailer. For a short time, the new installment demo of Transformers game play is free. Transformers: Fall of Cybertron is available to play free on XBOX and Playstation. To whet your appetite, Smutty has provided some clips from the game below. Great graphics, an established franchise and robots beating up robots. What more could any game ask for? Not for kiddies, rated T for teen with animated blood and violence. The same thing they see on Saturday morning cartoons. Smutty notes the large amount of successful animated films (Madagascar, Brave, Ice Age), and predicts this trend will continue as entertainment merges more into everyday life. Now Smutty has discovered a great new animated series on Yahoo, Electric City created by Tom Hanks (yes, that Tom Hanks). The concept falls into dark, film noir, post-apocalyptic category with very mature themes, action and speech. Do not let the kiddies see this. Do not let the teenagers see this. But as adult entertainment, this is superior work and the twists and turns keep you guessing who is on the side of good. Smutty has posted the first three episodes below to get you hooked into the fun. Have a great weekend! Smutty has been keeping a close eye on robots. They may interfere with his plans to take over the world. Smutty recently discovered that robots can now walk up stairs. And now, Willow Garage has created a great personal use robot and the software to run it. This robot combines great dexterity and mobility with advanced customization ability. Smutty smells threat. If humans get their needs met by robots, they won’t be hypotnized by their cats’ purring into following Smutty. Fortunately for Smutty, the robot has one huge drawback; it costs $400,000. Welcome to Smutty’s new home. The whacky fun and antics will continue here starting now. Let’s look at some videos. First Arnold gets inducted into the Comic-Con hall of fame, then a quick look at the hero All-Star movie Expendables2. This may not be the best scripting in the world, but Smutty gives it 2 paws up for pure adrenaline-fueled action. Let’s face it, no one watches Sylvester, Arnold, Bruce and company for intellectual stimulation. We see their movies to watch stuff blow up and bad guys get their butts kicked. And we don’t get disappointed. Arnold get his due at Comic-Con 2012. Wake up to some great funny for Wednesday. These should get even Mr. Grumpus through the week. Disclaimer; Smutty will not pay for dry cleaning if you spit out your coffee or Coke when reading these. Enter your email address to receive notifications of new Smutty Rants by email.